Drag B to find the maximum angle of reflection. 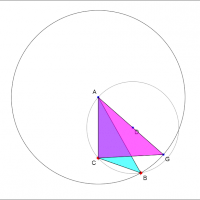 The circumcircle of ABC is the locus of all points which subtend the same angle on chord AC. In general G is inside the circumcircle and so angle AGC < angle ABC. The exception is when B=G.